This is a republishing of the earlier post on Petersen Aviation. My thanks to Jim Bergman for his emails which filled in so much information on this operator and also to Allan Wooller for the photographs. Petersen Aviation was founded by Vern Petersen in late 1957 and it was this company that gave Wairoa its first air service. On the 17th of December 1957 the Civil Aviation Division granted Petersen Aviation a non-scheduled passenger and freight service licence to operate from Napier to airfields throughout New Zealand with Mooney Mk 20 ZK-BUN (c/n 1130) and Cessna 172 ZK-BUZ (c/n 28138). 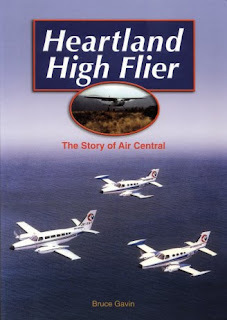 About the same time Petersen Aviation was granted its licence Jim Bergman was engaged as the company’s pilot, though at that stage he hadn’t sat his commercial pilot’s flight test due to the unavailability of a flight testing officer. On the 15th of December 1957 he had his first flight in a Cessna 172, ZK-BUZ (c/n 28138). He recounts that flight saying, I had never ever flown a tricycle undercarriage aircraft before. My first flight in the Cessna 172 was on a three hour charter flight as Pilot in Command. It never occurred to me or anyone else that we needed a separate rating from the Cessna 170 which I was type rated on so I never ever obtained that 172 rating. Incidentally, four years later ZK-BUZ was part of the fleet of Jim’s own company the Auckland Flying School. A few days later on the 19th of December 1957 a topdressing pilot, Peter Wolfe who must have held an instructor rating, gave me a one hour dual conversion on the Mooney. I undertook and passed my CPL flight test with Eric Ormansen on the 22nd of January 1958 in Wellington in Tiger Moth ZK-AOY. My Flying for Petersen was now legal! Cessna 172 ZK-BUZ at a Wellington on a very wet day. Petersen Aviation were able to use the 172 as a back up to the Mooney. On the runway behind the 172 you can pick out on of the RNZAF's Handley Page Hastings. During my employment up to starting the newspaper run in March I did a surprising amount of charter flying for Petersen and instructing for the Napier Aero Club. I obtained an Instructors rating on the 28th of January, just 6 days after my CPL and with no additional training… a bit different from today! The Dominion run was first flown on the 16th of March 1958 in Cessna 170B ZK-BJS (c/n 20351) which was later sold to the Auckland Aero Club. Vern Petersen was my passenger on this flight which I now know was grossly overloaded… we never weighed anything in those days! The service was direct from Napier to Gisborne and return and took 45 minutes each way. Cessna 170 ZK-BJS was the first aircraft to operate Petersen Aviation's service. It was registered to the Central Hawkes Bay Aero Club from the 7th of June 1955 to the 1st of November 1960. I commenced operating the Mooney on the service from the 20th of March 1958. The Mooney cut the flying time down to 35 minutes unless one had to fly around the coast due to bad weather. I was nearly always overloaded and even at times carried a passenger! I often flew the Mooney from the right seat as loading the newspapers I had to use the pilot’s seat for papers as the only door was on the right hand side and it was impossible to climb over them to get in. The Mooney was not really very suitable for the run but a delight to fly. I last flew this service on April 7th so I guess that’s when Bill Cookson bought the run and the service was flown by the far more suitable Cessna 180 and also included Bill Cookson's base at Wairoa. Wairoa was still closed to commercial operations due to the wet soft surface but this didn’t worry Bill or, it appears, CAA. He also used to pick up passengers from topdressing strips. I continued flying charters for Petersen and instructing at the Napier Aero Club until the following year when I joined the Hawkes Bay and East Coast Aero Club as CFI on the 17th of March 1959. In 1961 I again flew the service for a couple of weeks in a Cessna 185 when Bill Cookson wanted some time off. At that time I was a co-pilot for NAC on DC3s. 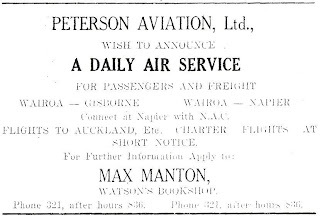 Ooops... the Wairoa Star had a typo, in the ad and the article a few days later... Petersen is spelt with an "e" not an "o"... Wairoa Star, 5 May 1958. The Wairoa Star of the 23rd of July 1958 carried the news that Cookson Airspread Ltd., had taken over the Dominion contract. The Cessna 180’s registration was transferred to Cookson Airspread on the 22nd of July 1958 and ZK-BVQ and subsequent aircraft continued the Dominion contract, offering a passenger and freight service to and from Wairoa until 1995. There are a final couple of postscripts to the brief story of Petersen Aviation. The first was found in the Wairoa Star of the 16th of September 1960 which reported, “A Mooney M20 aircraft crashed four miles from Taihape at 9 am today killing the pilot... The aircraft which is believed to be owned at Napier, struck a tree before crashing. There was low cloud and drizzle at the time.” While Petersen’s aircraft came to a sand end, Jim Bergman, Petersen’s first pilot, rose through the ranks of New Zealand aviation becoming an Air New Zealand Boeing 747 captain as well as founding one of New Zealand’s more successful third level airlines, Great Barrier Airlines. The first operator to use them was the short lived Sky Travel. The 402s weren't cheap for airlines that had lean routes in an environment where the national carrier was protected. Here Cessna 402s ZK-CSX and ZK-CSZ are seen on their first visit to Masterton in early 1968. Operating at the same time as Air Central was James Air. Unlike Air Central James Air were primarily in competition with NAC on Cook Strait services from Wellington to Blenheim and Nelson. Like most of the third level airlines of the age James Air was to become another statistic of the airline industry of the time. For my profile about James Air see http://3rdlevelnz.blogspot.co.nz/2012/06/james-air-sun-city-airline.html. Maurice Collins sent in this picture of United Aviation's Beech 58 Baron ZK-KVY (c/n TH-553). Maurice did his multi-engine rating in KVY with United Aviation. About to depart for Wellington... Beech Baron ZK-KVY at Palmerston North on 25 August 1993. ZK-KVY is a significant aircraft as it was Eagle Air's first twin engine aircraft, registered to them as ZK-ECA. For more on the early days of Eagle Air see http://3rdlevelnz.blogspot.co.nz/2013/01/eagle-airways-part-1-fledgling-eagle.html. ZK-ECA was with Eagle Air from March 1975 until the 18th of January 1988 when it was registered to Cook Islands airline Air Rarotonga. After returning to New Zealand it was registered to Airport Services Ltd of Palmerston North on the 15th of July 1991. The following day it was re-registered as ZK-KVY. ZK-KVY was cancelled from the register on 27 November 1997. But does anyone happen to know what happened to it??? Soundsair also used ZK-LAL on its Cook Strait and Marlborough Sounds charter and scheduled services. It is seen here at Ardmore on 30 November 1996. ZK-LAL was subsequently used by Great BArrier Airlines on courier and scheduled work and is now operated by Air Manawatu. Allan Wooller has emailed me some great photos of Air North's Herons. Air North's family tree goes back to the Rotorua Aero Club's commercial operation, Rotorua Aerial Charter, and Geyserland Airways. 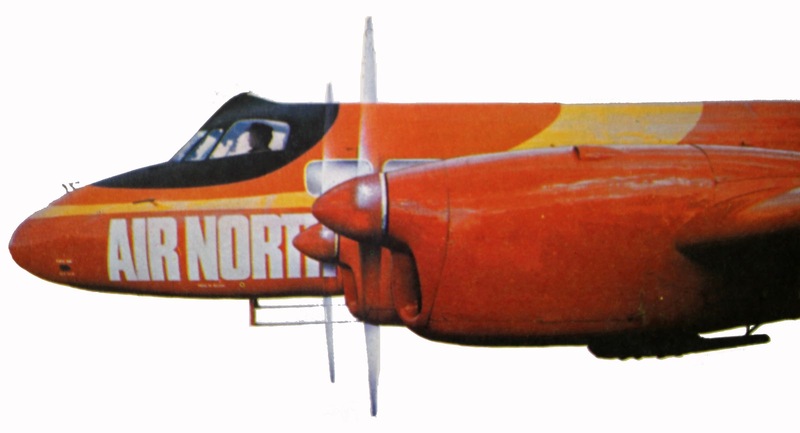 Air North itself was established in 1972 and operated around the central North Island until 1978 when its name was changed to Nationwide Air. Masterton was not one of Air North's destinations but Ian captured de Havilland 114 Heron 1B ZK-BBM there in August 1977. A rather sad de Havilland 114 Heron 1B ZK-EJM at Ardmore in October 1977. This is the result of the accident on the 9th of May 1977 at Ardmore. The aircraft had touched down far down the runway and swerved to the right when the left brake failed. It crossed a drainage ditch and came to rest with serious damage to the nose gear, propellers and both wings. Although the intention was to repair the aircraft, it lay derelict and was later broken up. EJM's replacement was de Havilland 114 Heron 1B ZK-EKO seen here at Rotorua in November 1977. March 1988 must have been the poorest month I have ever had in New Zealand for plane spotting... 8 photos for the month... and here they are! 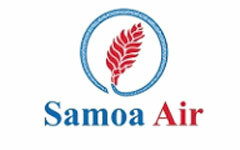 New Air Service to Tonga’s Niuas. Following the withdrawal of Chathams Pacific Air Samoa is set to provide an air service to Tonga’s Niuas using its Britten Norman Islander aircraft. The company plans to operate a Friday service from Samoa’s Falelolo International Airport to the northern Tongan island of Niuatoputapu before continuing on Vava’u. Once a fortnight the aircraft will then do a return Vava’u-Niuafo’ou service before returning to Samoa via Niuatoputapu in the afternoon. These services are being carried out under an agreement with the Government of the Kingdom of Tonga. This is in support of the new carrier Real Tonga. In addition to the new service the company also operates five weekly international services to Pago Pago in American Samoa from both Fagali’i (which is in Apia – as opposed to Faleolo International Airport which is 40 kms from Apia) and Maota on the island of Savai’i. The company also operates up to five daily flights between the islands of Upolo and Savai’i from Faleolo to Maota/Asau on an air taxi basis. Any photos of Air Chathams/Chathams Pacific aircraft in the Pacific. Any information on Reef Air flights to and from Niue... when they began ended etc. 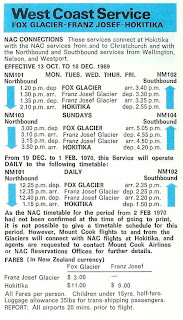 Mount Cook Air Service's scheduled skiplane service from Fox Glacier and Franz Josef to Hokitika that operated from late 1968 to early 1971 is the first third level service that I remember. When we would go up to the Hokitika Airport to see someone off on the Friendship to Christchurch I would talk my parents into staying on to watching the DC-3 go to Westport and further north and then the skiplane to South Westland. This is story of the skiplane air service. 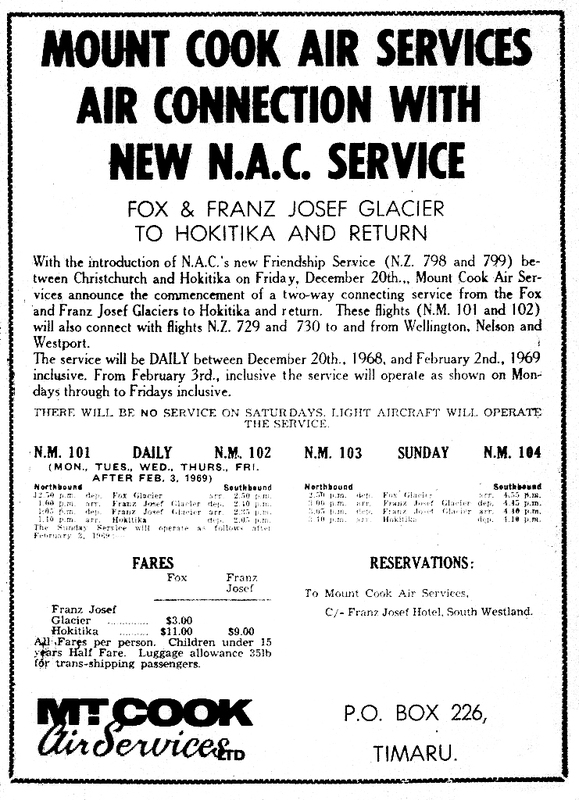 For many years Air Travel, NAC and West Coast Airways operated an air service south from Hokitika to South Westland. 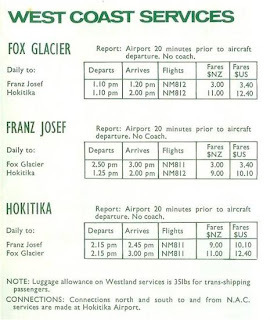 The last of these operators, West Coast Airways, as well as operating a service to Haast, also operated a thrice weekly service to Franz Josef and Fox Glacier with De Havilland DH89 Dominie aircraft. This service ended on the 31st of March 1967. 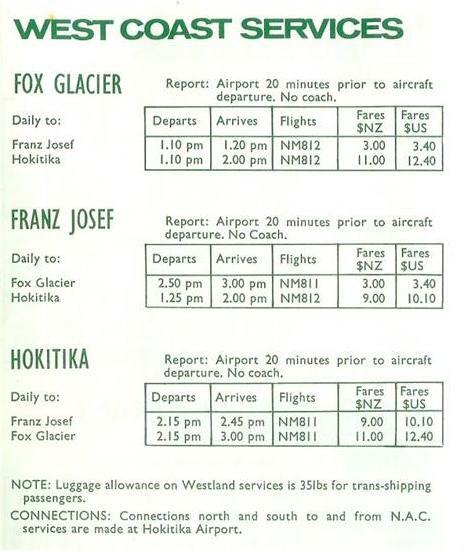 The following year, on the 20th of December 1968, NAC commenced trans-alpine Fokker Friendship flights from Christchurch to Hokitika. 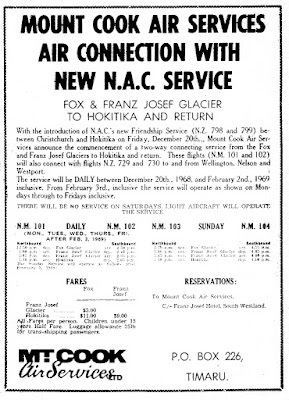 On the same day Mount Cook Air Services reintroduced flights to and from South Westland by starting a non-scheduled service from Fox Glacier and Franz Josef to Hokitika using Cessna 185 skiplanes. The Hokitika Guardian of that day reported that Air traffic movements will turn Hokitika Airport into a 'mini Harewood' today when the start of the new trans-alpine air service sees connecting flights from north and south. First to arrive is the DC-3 from Wellington at 1.35 pm. Then a Mt Cook Air Services Fox Glacier based 6-seater Cessna 185 touches down at 1.45 pm. The Friendship lands at 1.50 pm and departs at 2.10 pm on return to Christchurch and the other two aircraft leave shortly afterwards on return to Wellington and Fox Glacier. 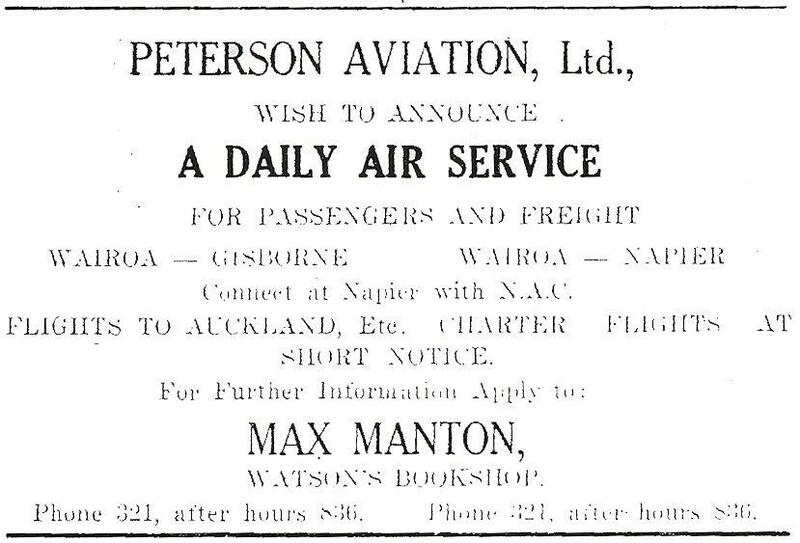 The same day there was a large advertisement for the air service in the Greymouth Evening Star. These are the only two references to the air service in the local newspapers. The first flight from Franz Josef to Hokitika and return was flown by Lyall Hood, a son of Hokitika, in Cessna 185D Skywagon ZK-CKT on the 20th of December 1968. Over the summer holidays until the 2nd of February 1969 the skiplane flights operated on a daily basis, if there were passengers offering. Cessna 185 ZK-CKT, which flew the first South Westland-Hokitika skiplane service at Fox Glacier. Photographer unknown. After the summer holidays, from the 3rd of February 1969, the Friendship service from Christchurch to Hokitika was reduced to operate on only four days a week, namely on Mondays, Wednesdays, Fridays and Sundays. The Douglas DC-3 service to and from Wellington, Nelson and Westport to Hokitika continued to operate Monday to Friday. 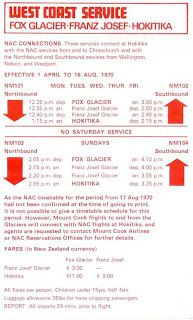 While the introduction of the Friendship service was the stimulus for the skiplane service, it continued to operate six days a week, Sunday to Friday, connecting with all the NAC Friendship and DC-3 services at Hokitika. One of the mainstays of the air service, Cessna 185 ZK-COH at Franz Josef in December 1970. From 1970 over the peak summer season or when larger loads dictated the need, de Havilland 89B Dominie ZK-BCP was also used on the service between the Glaciers and Hokitika. The Dominie's first flight on the Hokitika run, NM101/102, was flown by Jerry Savage on the 3rd of February 1970. ZK-BCP thus became the last Dominie to operate an airline service in New Zealand. De Havilland 89 Dominie ZK-BCP was occasionally used instead of the skiplane on the Glacier service. It is seen above at Franz Josef and below at Hokitika on 12 July 1970. On the 5th of June 1970 the DC-3 finally bowed out of services to the West Coast and Hokitika, for a time, lost its one plane service to Wellington. This meant all passengers for the capital now had to fly on the increased Sunday to Friday Friendship service to Christchurch where they transhipped to Boeing and Viscount services to Wellington or other centres. 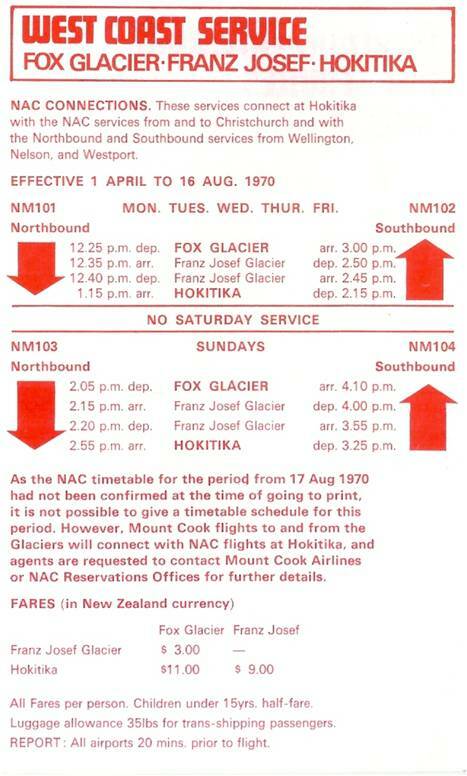 The skiplane service continued to meet NAC services at Hokitika when there were passengers offering. 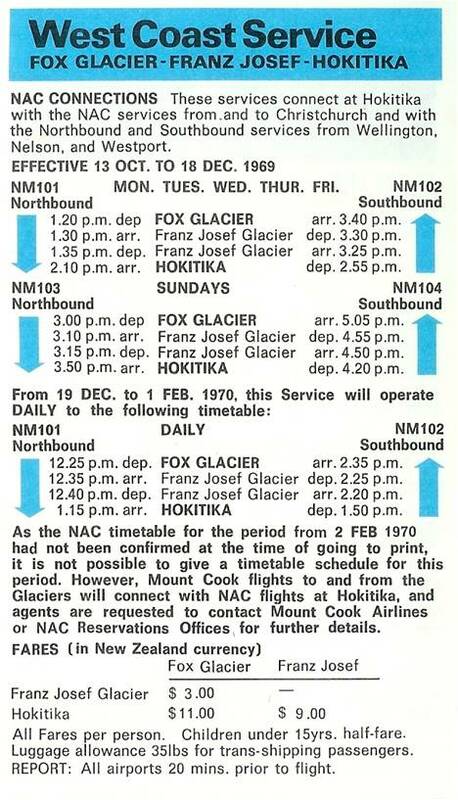 Over the holiday periods NAC operated Saturday services to Hokitika and the skiplane service connected with these flights as well. The meeting of the air services... NAC Friendship ZK-NAF and Mount Cook Air Services' Cessna 185 ZK-COH at Hokitika. As there is no DC-3 present it was either taken after the 5th of June 1970 or, if before that, on a Sunday. In the nine months from July 1969 to March 1970 142 flights were operated carrying 249 passengers and in the 12 months from April 1970 to March 1971 147 flights were operated carrying 247 passengers. The service was mainly used by tourists. While some locals used it road travel was obviously much more convenient and economical. 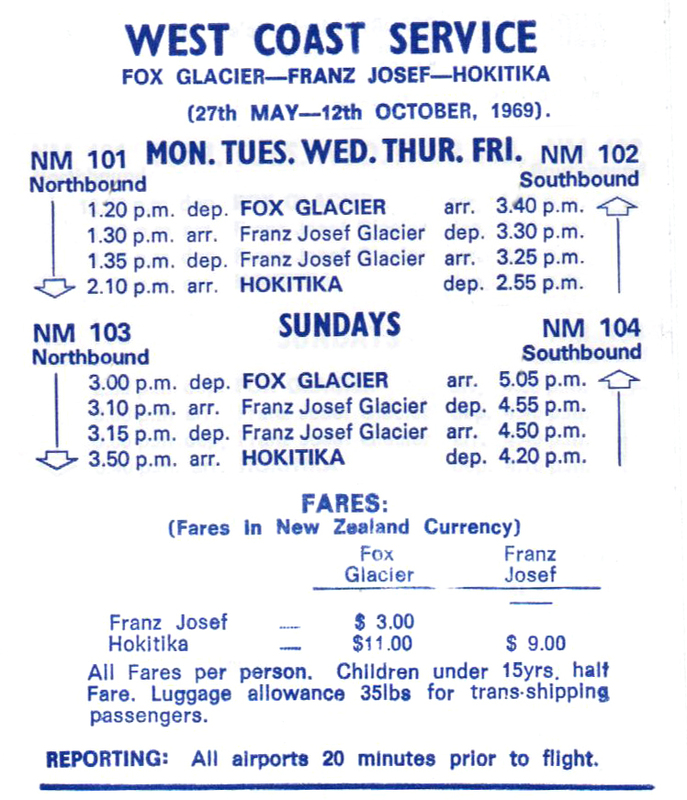 The final flights between Fox Glacier and Hokitika operated in February 1971 and between Franz Joseph and Hokitika, in March 1971. 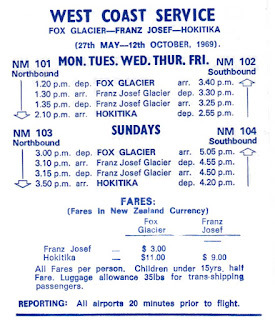 In September 1971 Mount Cook Airlines were given Air Services Licensing Authority approval to abandon the non-scheduled passenger and freight service between Hokitika, Franz Josef Glacier and Fox Glacier. So ended South Westland’s last regular air service.